What role, if any, should small cap growth stocks play in your ETF portfolio? 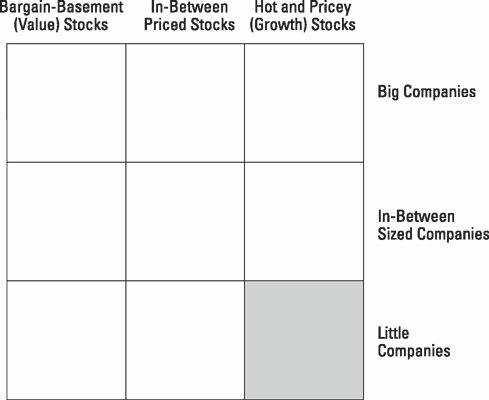 The following figure shows where you can see how small growth fits into an investment style grid. The shaded area is the portion of the investment grid represented by small growth stocks. In the past century, small cap stocks have outperformed large cap stocks just as assuredly as Honduras has produced more Hondurans than the United States. The volatility of small cap stocks has also been greater, just as assuredly as the United States has more roller coasters than Honduras. In terms of return per unit of risk (risk-adjusted rate of return), however, small caps are clearly winners. And so it would seem that investing in small caps is a pretty smart thing to do. But please know that not all small caps are created equal. The true stars of the small cap world have been small cap value stocks rather than small cap growth stocks. How slow-growing, often ailing companies have beat out their hot-to-trot cousins remains one of the unresolved mysteries of the investing world. But the numbers don’t lie. In fact, if you look at the numbers — over the past 20 years, small-cap value has returned 15 percent a year, while small-cap growth has returned 11.5 percent a year — you may be inclined to treat small growth stocks as a pariah. Please don’t. They belong in a well-diversified portfolio. Some years are clearly small growth years. The best example is rather recent: Small cap growth stocks have beaten both small value and large caps by a good margin over the past five years. Back in 2003, small growth was the undisputed King of Returns, clocking in at an astounding 50.37 percent. Who is to say that the long-term past wasn’t a fluke and that small growth may actually go on to outperform all other asset classes in the next 20 years?